This recipe was inspired by both the great Chef Gordon Ramsay as well as my favorite meal…BRUNCH!!!! When I think of brunch, I think of innovative dishes that really get those taste buds dancin’. I love the breakfast feel of brunch with a hint of lunch just tapping on the front door. This particular brunch dish brings together the Italian flavors of fresh rustic bread, garlic and olive oil (bruschetta) with an earthy balance of in-season wild mushrooms cooked to perfection. A brunch dish would not be complete without an oozing poached egg to bring the dish together. So without further ado, let’s get into this recipe. ***BONUS: Scroll to the bottom for my favorite brunch spots in both Miami and Boston! The slow cooker is a magical piece of kitchen equipment. Having the luxury of placing all your ingredients in one pot and letting the cooker do the rest is a B-E-A-UTIFUL thing. Slow cookers also come in a variety of sizes making it easy to cook large portions for your meal prepping needs. We wanted to share three recipes that can make your life a whole lot easier when it comes to meal prepping, or cooking in general. There is a chicken option, beef option and a vegetarian option. Let us know what you think! If you have any questions, feel free to leave us a comment. Enjoy! We can all agree that pizza is one of the best foods on the face of this planet. The soft dough and crispy crust that gently nestles a vibrant red and delicious tomato sauce in the center, topped with an endless amount of options! Many people refrain from indulging because it can be a high-calorie food. Well, we decided to take a fan favorite and turn it into something a little more healthier so you can enjoy it guilt-freeee!!!! We used a whole wheat alternative crust, low-fat cheese, and loaded it with tons of vegetables. ENJOY!!! With Valentine’s day right around the corner, what better “whey” to say I love you than cooking a beautiful breakfast for that special someone. This recipe is quick and easy to prepare and will be sure to put a smile on your valentine’s face. Oh! 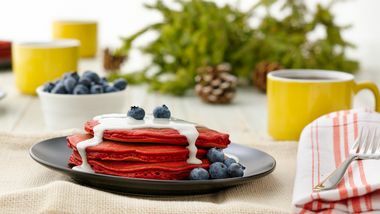 and did we mention, these are a healthier alternative to the traditional pancake? If you decide to surprise your loved one with these yummy valentine wheycakes, post your masterpiece on Instagram or Facebook, tag @nutrition4perfomance, and use hashtag #ValentineWheyCakes. Let us know how they come out!